Last year’s Judge Dredd movie brought Mega-City One’s toughest lawman to a wider audience in the U.S., but there’s a lot of backstory to catch up on, since the character debuted in the pages of the British science fiction comic 2000AD in 1977. Now the publishers of 2000AD are making it easy for new and old readers alike to sample some of the classic Judge Dredd stories by gathering them into Kindle e-books. Judge Dredd: The Dark Judges collects three story arcs about the Dark Judges, a truly bizarre quartet who wreak havoc on Mega-City One. 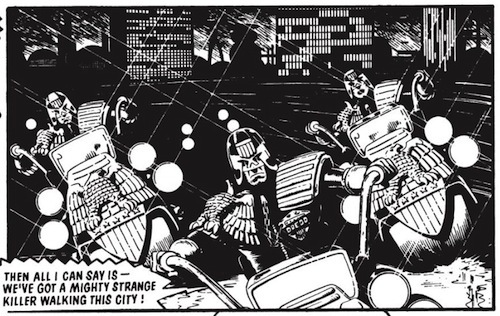 A bit of background, if you’re new to the series: Judge Dredd is set in a dystopian city of the future, where people live in huge apartment blocks, crime and decadence are everywhere, and a corps of helmeted “judges”—who function as police, judge, and sometimes executioner as well—keep the peace. Judge Dredd is the most badass of them all, but actually the main character in these stories is Judge Anderson, a tough, brainy female judge with psychic powers. That’s about all the background you need to enjoy these stories, so this e-book is a good jumping-on point for beginners. 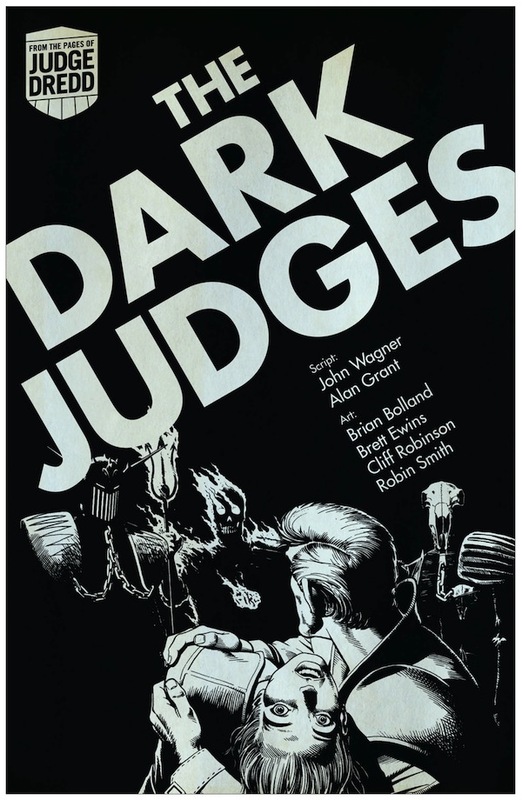 The first story features Judge Death, who hails from another dimension where he and his colleagues have decided that since all crimes are committed by living people, life itself must be a crime. 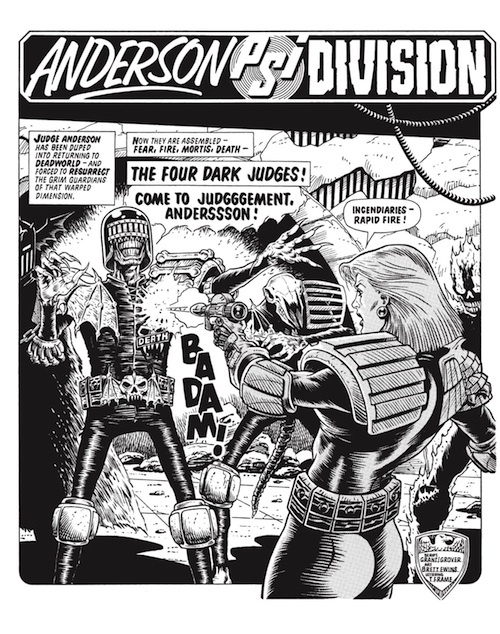 He pops up in Mega-City One and begins dispensing his twisted form of justice, and Judge Anderson has to outsmart him. In the next story, he is joined by the other three Dark Judges—Judge Fear, Judge Fire, and Judge Mortis—each of whom has a particular deadly power, and once again they go on a rampage, killing everyone they can find. In the third story, they trick Judge Anderson into allowing them back to Mega-City One. The stories have some clever sci-fi twists, and they throw in witty, if slightly dated, allusions along the way (one of the giant apartment blocks is named after Billy Carter, while the one for the old and infirm is the Ronald Reagan Block). Judge Anderson is a great character, strong and smart, with a wry sense of humor that irritates the other judges. Like its companion volumes, Judge Dredd: The Cursed Earth Saga and Judge Dredd: The Day the Law Died, this book has a “digital list price” of $6.99 but is currently discounted to $5.59 on Amazon. That’s not a bad price for 160 pages of comics, even if the page size is a bit small. The book is available for Kindle Fire, Kindle Fire HD, Kindle Cloud Reader, and the Kindle apps for iPad and Android devices.